I have really been enjoying my Anova Precision Cooker‘s. 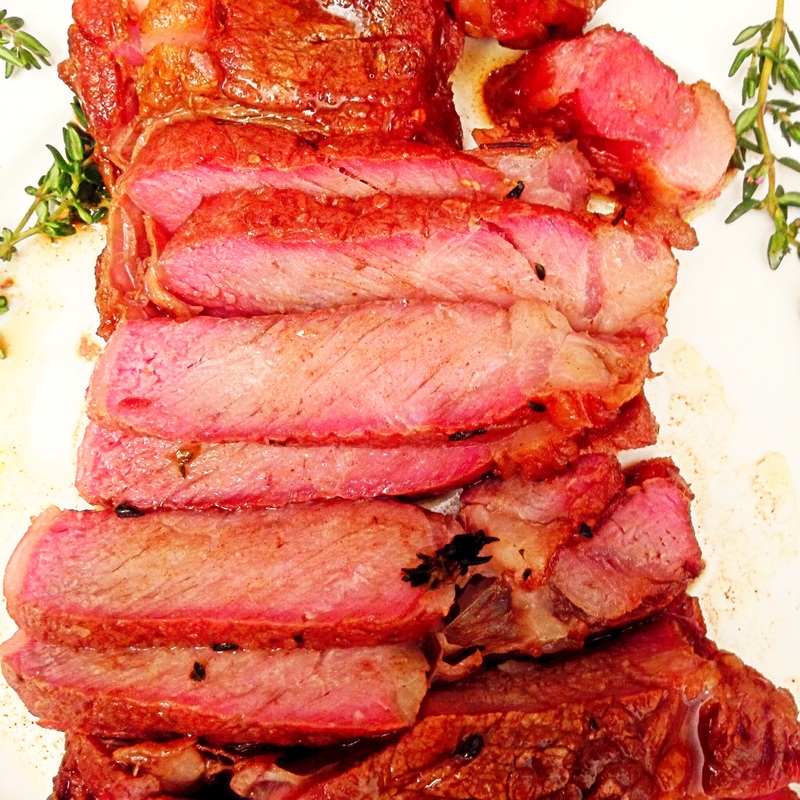 I expected my cooking to improve, but I never expected how much sous vide would change the way I cook. This past Sunday I went to my local farmer’s market and Whole Foods and as I was plotting out what I would cook for the week, it struck me: I could cook everything that I needed to make for the week with my sous vide cooker in one day–that day–Sunday–in less than 2 hours–1.5 hours to be exact, of non active cook time! Que the bells people, this thing is LIFE CHANGING!!!!! I don’t think I can cook any other way now. Cooking sous vide is a lazy girls best friend! I’m 4 meals in and there is no turning back for me! 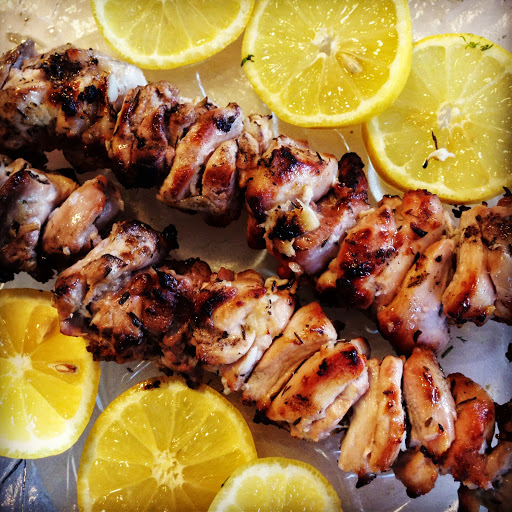 Every meal is fresh, restaurant quality and quick to make. If you’re in the market for a Christmas gift you might want to put an immersion circulator on your wish list–two words–LIFE CHANGING!!! Now to this steak. It was delish, the best steak I’ve eaten in some time! It’s actually the first time that I’ve cooked a rib-eye inside on a stove top. I always have my husband grill them. As great as the steak was I would have liked it a bit more rare than it was. But my husband likes them medium well, so if you happen to like it the way I do, then set the temperature on your circulator lower than 140F, 138F would probably work better. 3 tablespoons of a high temperature oil like grape seed or safflower. Directions: Fill a pot with enough water to come to cover the minimum level line on your circulator. Set your circulator to 140F and wait for it to bring the water to temperature. Meanwhile season both sides of your steak with sea salt and black pepper. 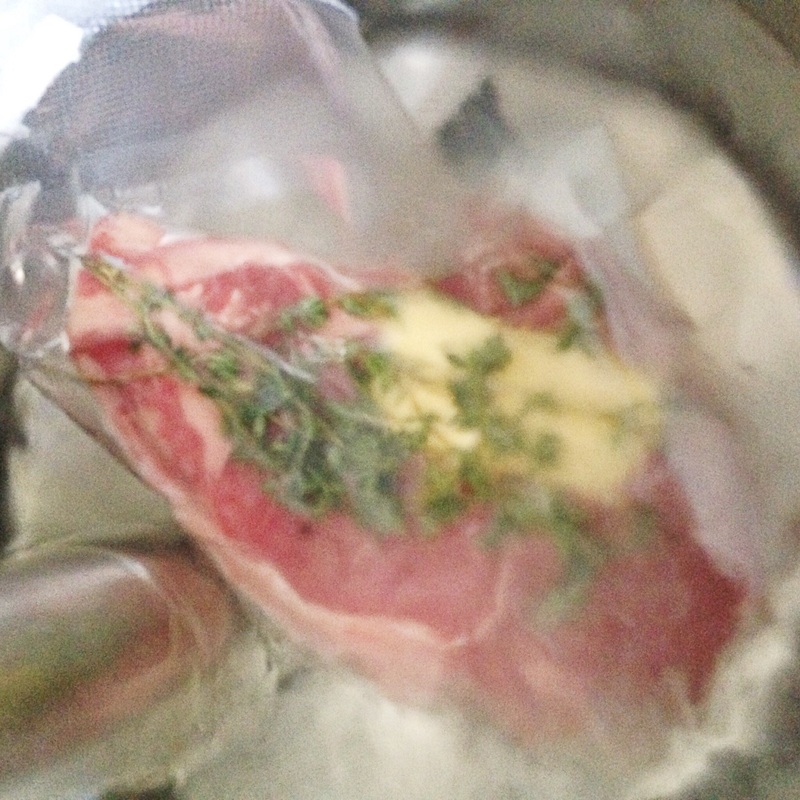 Add the steak to a vacuum bag, top with butter, thyme and garlic. 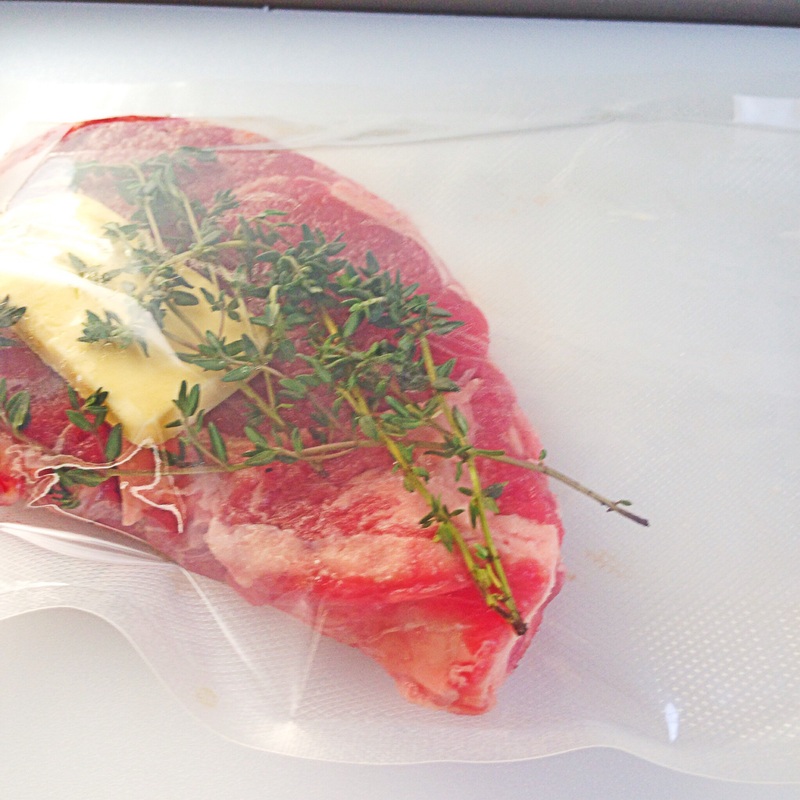 Seal bag shut using your vacuum sealer or water displacement method. Once the water has come to temperature add the sealed steak to the pot and cook for 1 hour and 22 minutes. 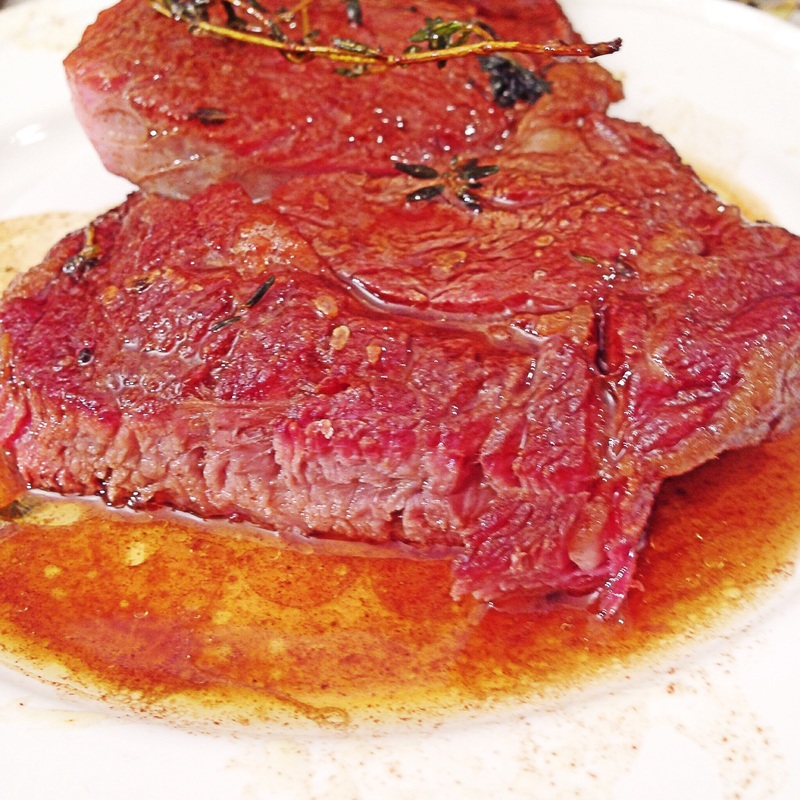 Once the steak has cooked for 1 and 22 minutes remove it from the water if you are ready to cook it right away, remove it from the bag and pat it dry and let it rest while you heat the oil in a skillet. 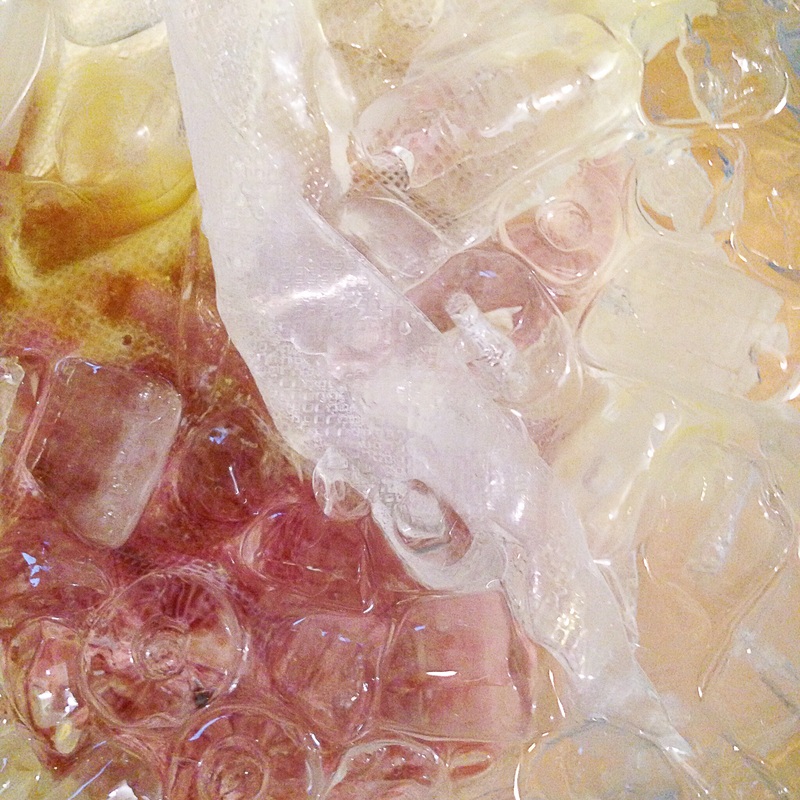 If you plan on cooking it later even if it’s only a few hours later place into an ice bath (1 cup of salt dissolved in 4 cups of warm water, then add 2lbs of ice). 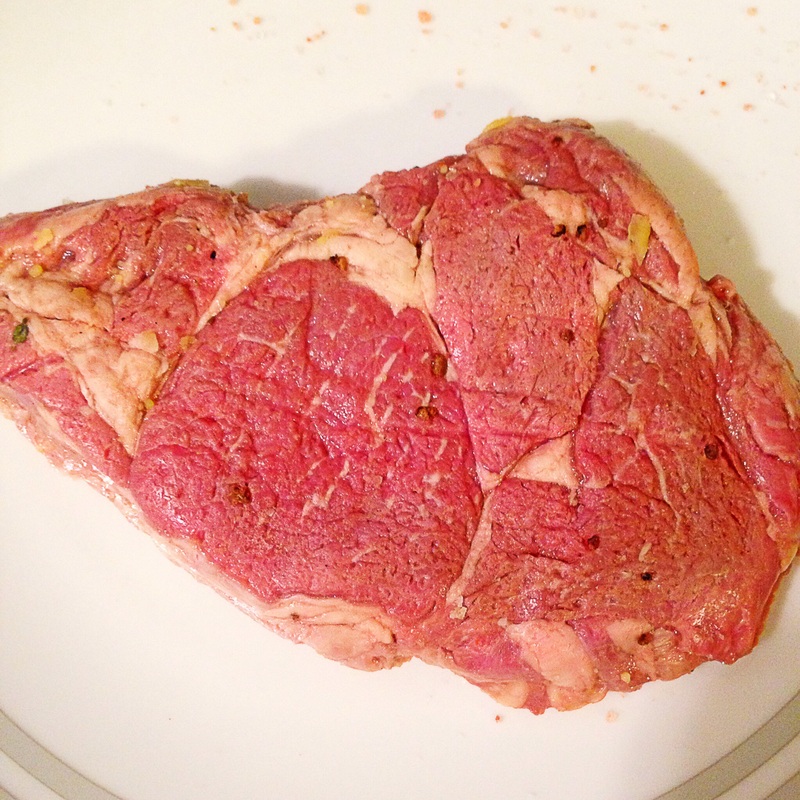 Let the steak sit for 1 hour in the ice bath before refrigerating. When you’re ready to cook the steak. Heat 3 tablespoons of oil in a cast iron skillet. Remove it from the bag, discard the thyme leaves and garlic. Season the steak with a little more sea salt. Once the oil is hot add the steak, brown it on both sides making sure to flip it constantly. Add the 2 tablespoons of butter and allow it to melt. 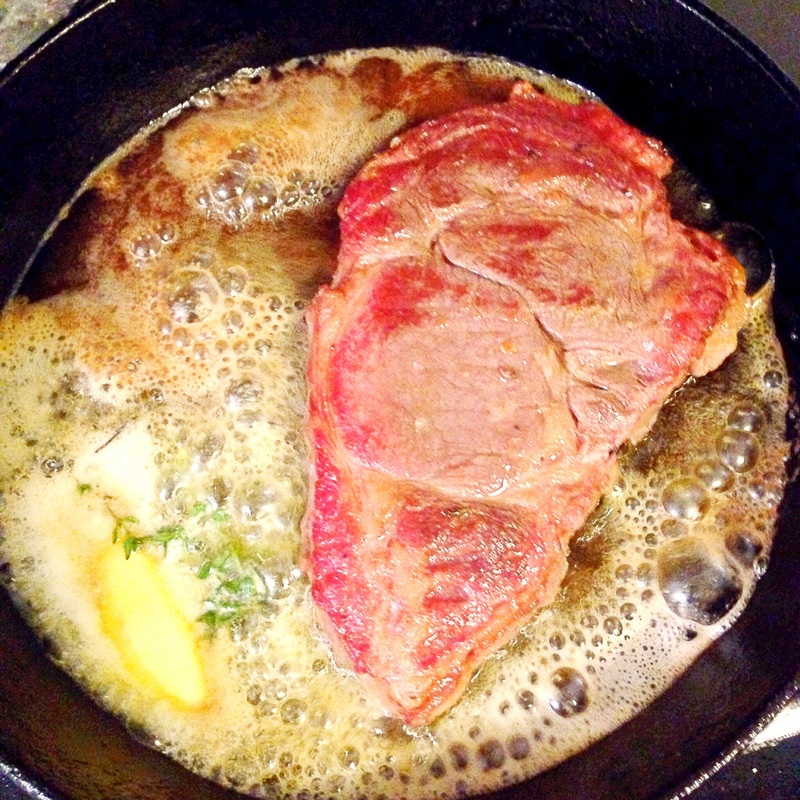 Add in 3 sprigs of thyme and baste the steak with the oil in the pan. Making sure to focus on the areas of steak that have fat–you want to brown those parts. 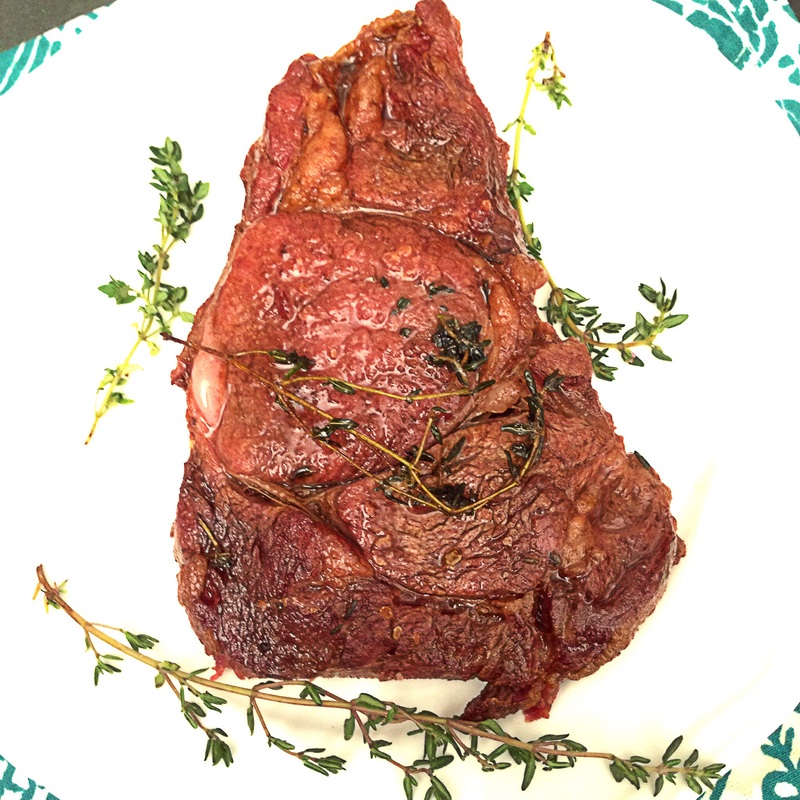 Once the steak is nice and golden brown–about 5-6 minutes remove it from the pan, serve and enjoy–no need to rest a sous vide steak. This entry was posted in dinner, Food, Food blog, gluten free, Healthy Whole Food Blog, low calorie, low carb, paleo, quick fix meals, recipes and tagged dinner recipes, easy dinner recipes, Food, gluten free, how to pan sear a steak, kid friendly recipes, lazy dinner recipes, low carb, meal prep, Paleo, pan seared steak, recipe, recipes, sous vide recipes, steak recipes, whole 30. Bookmark the permalink.